Hibs 3, Motherwell 1. SPL. Saturday, November 23, 2002 . Motherwell crashed to their tenth successive Scottish Premier League defeat as their discipline also crumbled at Easter Road. 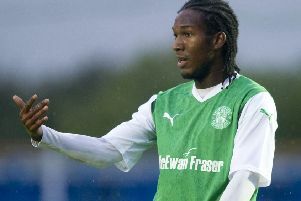 Steven Ferguson, on loan from Tottenham Hotspur, gave the Fir Park side the lead two minutes after the break against Hibs. But the home side struck back through Mixu Paatelainen and Tam McManus after Well defender Daniel Sengewald had been dismissed in the 56th minute for a late challenge on John O’Neil. And Motherwell’s discipline simply collapsed in the dying moments of the game as Stephen Pearson saw red for hitting out at home substitute Grant Brebner. David Partridge joined his two team-mates in the early bath for his part in the same incident. Hibs midfielder Brebner had only been on the field for two minutes when he also saw red from referee Dougie McDonald. Easter Road captain O’Neil scored Hibs’ third in injury time from the penalty spot as 18 men completed the game. Motherwell forward James McFadden was so incensed by the late red cards that he was man-handled down the tunnel by manager Terry Butcher to prevent another red card. Well talisman and Scotland internationalist McFadden returned from injury with his side desperate for a first win since September 10, while Sengewald returned to the starting line-up. The visitors applied all the early pressure with the Motherwell goal surviving several scares. After a tentative opening to the game the visitors came into the match more and Ferguson had a good shot deflected wide by Alen Orman. Having enjoyed most of the pressure in the first half, Hibs fell behind just two minutes after the break following a terrible mix-up in defence. Derek Adams played a hopeful ball forward and, although there seemed little danger, Gary Smith left the ball to Nick Colgan and Ferguson stole in to nod the ball over the goalkeeper and into the empty net. Well’s luck changed nine minutes later. Sengewald had already been cautioned for persistent fouling and his crude challenge on O’Neil left the referee McDonald with little option to deliver a second. The home side drew level three minutes later when Paatelainen headed home a great Derek Townsley cross. Hibs were in front five minutes later after Paatelainen turned provider to head the ball on for McManus to head home from close range. Brebner had only been on the field as a substitute for two minutes when Pearson crudely lunged at him. Pearson was dismissed while the Hibs midfielder was also sent off for appearing to raise a hand to his assailant. Referee McDonald was not finished and brandished another red to Partridge for his part in the incident. The goalscoring was not complete either and O’Neil slotted home from the penalty spot after being brought down himself by Well keeper Francois Dubourdeau. Hibs: Colgan, Fenwick, Smith, Zambernardi, Orman (Townsley 55), O’Neil, Wiss (Brebner 85), Murray, James, Paatelainen, Luna (McManus 35). Subs Not Used: Caig, Jack. Motherwell: Dubourdeau, Corrigan, Sengewald, Partridge, Pearson, Adams, Cowan, Ferguson, Hammell, Lehmann, Fagan (McFadden 66). Subs Not Used: Woods, Khaled, McDonald, Kinniburgh.